Accept tips on credit card sales and automatically charge a certain percentage gratuity to a table by entering the number of guests at the table. Create an unlimited number of custom payment types. Checks, Vouchers or Gift Certificates, Mynt can take it all. 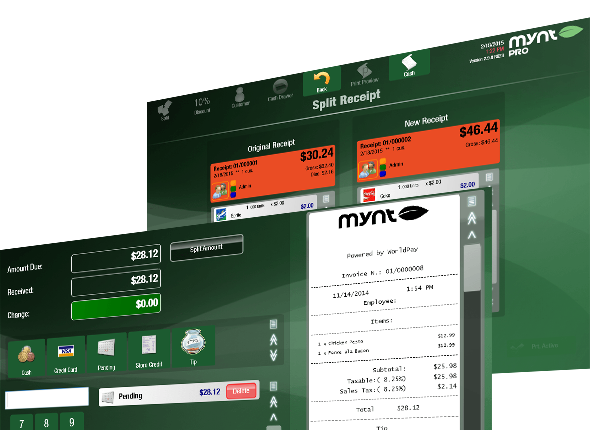 Mynt gives you the option to effortlessly split checks between multiple customers. Set up charge accounts for your repeat customers so you can track and settle charges. Create discounts to take either a set percentage or dollar amount off a entire purchase or simply discount individual items on the fly. Checking out in Mynt couldn’t be easier. It can be completed in just 4 taps on the screen. A custom quick tender button allows you to close out either cash or credit sales in just a couple of seconds. Mynt allows for custom table layouts so you can create a map of your business. This makes finding an open table quick and easy. From the table layout you can quickly see what tables are open, and see what each table has ordered. Each area can have it’s own custom price level, meaning you can apply special pricing automatically based on where the customer is located. Quickly create tabs by just entering a name, tabs can even be moved into or out of a table. Items can easily be created or edited from any of the stations, and changes will automatically be shared to all of the stations in your location. Add on items can be set for any item on the menu. This makes entering items into the system much faster and can help greatly increase up sales. Modifiers can be used to customize orders. Modifiers make it clear to kitchen staff how a dish should be prepared to make them more accurate and efficient. Add custom images or color-code your products to allow your staff to quickly and accurately enter their orders. Tax can be customized for standard percentage sales tax, per item tax, or even based on the volume of the item. Multiple taxes can be grouped together allowing Mynt to handle complex taxes for items like liquor or glass bottles that can have multiple taxes beyond standard sales tax. Run an end of day report which includes daily sales, and an optional list of items sold. Use any of the 20+ built in reports to quickly gauge how your business is running. Each report can be customized to only show the current day, week, month, or any custom date range. Search through all past sales to either perform refunds or re-print receipts. Each report can be exported to a PDF or an Excel spreadsheet making Mynt reports compatible with hundreds of devices and softwares. Reports have built in graphs making it easy to see sales trends and understanding the data included in each report. Custom user accounts for each Employee allow you to track sales made by each employee. Mynt supports 10 languages, including Spanish, and Chinese. Quickly switch between happy hour and standard pricing with just a few taps on the screen. Managers can load any past transaction and void the sale to reverse charges, even after the sale has been completed. Set custom user permissions on each employee, allowing your employees to have as much or as little access as they need. Keep track of stock levels so you know what is selling and what needs to be ordered. Generate purchase orders automatically based on the number of items sold. With Mynt you can setup up to 6 different remote printer, plus a standard receipt printer. Create your own printer groups to choose which items will print at each printer. You can even have items print at multiple printers. Easily add notes to an order to ensure that guests request are communicated from the front to the back of the house. Choose which payment types you would like to print receipts for so you’re not wasting paper on receipts that are not needed. Get your name out! Load your own custom logo to print on every receipt. You can also place a custom message at the top or bottom of the receipt.